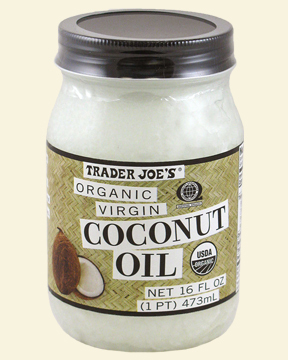 ∼ Coconut Oil For Hair and Skin! on dry skin before taking a shower. While that is still one of the great advantages of using this natural wonder, it has so many additional uses. As I’ve said many times, I suffer from major itchies. My scalp is one dry area that tends to seek relief more than anywhere else. Coconut Oil has been a godsend for my stinging scalp. I recently started massaging the oil into my head and leaving a mask of it on for about an hour before I shampoo. It feels heavenly. I have tried various other scalp saving products and techniques that may work for a week or so but the dry, itchy feelings always come back. Not this time! My hair also feels softer and thicker. I also use this outstanding oil as a body and face moisturizer after bath and shower on myself and my toddler. It works wonders as a barrier against diaper rash and makes skin soft and smooth. Coconut Oil contains 50% Lauric Acid which is an antiviral component found in mothers milk. It has properties known to help treat cold sores, boils, acne and warts. Coconut Oil also contains loads of Vitamin E which reduces scarring (stretch marks during pregnancy) and aids in healing cuts and scrapes. I’ve also read that ingesting a tablespoon or 2 daily will reduce inflammation in the body and combat rosacea, psoriasis and acne. Pretty amazing stuff. brand because that grocery store is my mecca) is all natural, chemical free and very inexpensive! 16 ounces sells for the bargain price of $5.99. Beauty in a jar for under six bucks. You can’t go wrong! OMG OBSESSED! Oh! And you can use it for cooking, too!